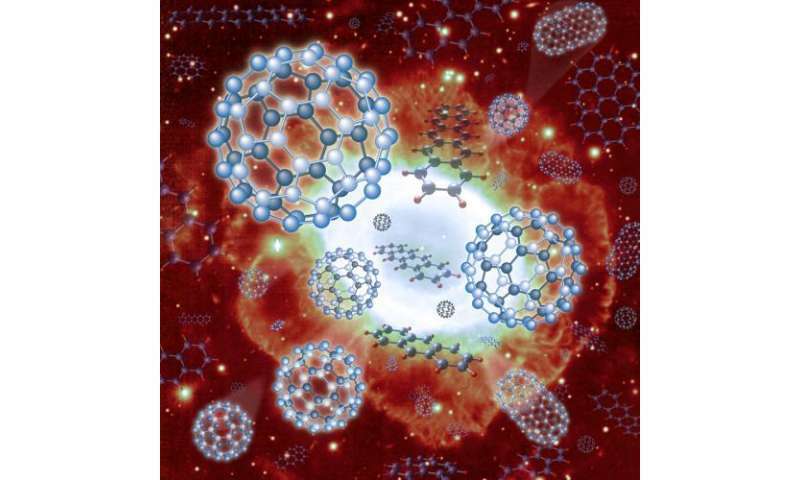 An international team of astronomers led by Masaaki Otsuka (Academia Sinica Institute of Astronomy and Astrophysics or ASIAA) has detected the C60 fullerene (molecules of carbon with 60 atoms arranged in patterns resembling a soccer ball) in the dying star M1-11. Data from the Subaru Telescope, the Spitzer Space Telescope (SST), the Very Large Telescope (VLT), the 1.88 m telescope at the Okayama Astrophysical Observatory (OAO), and the Japanese infrared astronomy satellite AKARI all contributed to this finding, which takes scientists closer to understanding the prevalence and formation of C60 in space. Interstellar space is teeming with solid, minute particles called "dust", a large fraction of which are rich in carbon that was formed in the cores of solar-type stars. When dust grains are ejected into interstellar space from dying stars, they are catalysts for the formation of the next generation of stars. Therefore, an investigation into the amount and composition of the dust produced by dying stars as well as its subsequent return to interstellar space is a crucial step in understanding stellar evolution and the chemical evolution of galaxies. The C60 fullerene is a molecule consisting of 60 carbon atoms, with a geometric pattern that resembles the seams on a soccer ball (Figure 1). It is particularly interesting since C60 is an extremely stable molecule, which easily forms in laboratories on Earth, and probably exists in abundance in interstellar space. However, its detection in space has only been recent (2010) and elusive, having been found in about 20 objects. Scientists do not know yet how prevalent it is or what sort of environment is necessary to produce it. How much C60 exists in space? Since C60 is very stable, could there be much more C60 in celestial objects than on Earth? To answer these queries, the team focused on a class of dying stars called "planetary nebulae" (Note 2), because cosmic C60 has previously been detected in these objects. Otsuka analyzed all of the relevant spectroscopic data taken by the SST and analyzed spectral data from more than 300 planetary nebulae, checking each carefully for evidence of C60 infrared wavelengths. The team identified C60 in several planetary nebulae, including the first detection of C60 in M1-11 (Figure 2). 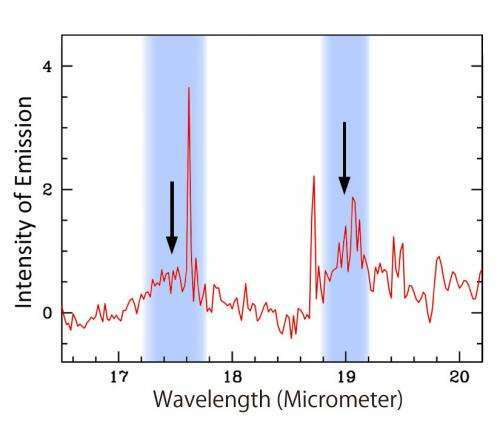 Otsuka also found evidence for C60 in the archived spectra of M1-11 taken by the VLT and proceeded to estimate the total amount and the temperature of C60 in M1-11. Using data obtained with the SST and AKARI, he also investigated the dust grain composition in M1-11 and obtained the amount in each component. Although M1-11 is rich in carbon-bearing molecules and minerals, C60 makes up only 0.01 percent of the total dust mass. Therefore, he concluded that C60 is very rare in the interstellar medium. How, then, did C60 form in space? Characterizing the physical conditions in the environments that contain C60 is an important step in understanding this process. Otsuka applied the method of elemental abundance analysis to unveil the evolutionary status of M1-11's nebula and its progenitor star, which were largely unknown until his research. The team used the 8.2 m Subaru Telescope's High Dispersion Spectrograph (HDS) and the Okayama 1.88 m telescope's near infrared imager and spectrograph (ISLE) to precisely measure line strengths of chemical elements such as carbon (C), phosphorous (P), and krypton (Kr). Detailed analysis of the spectra (Figure 3) revealed the relative amounts (abundances) of eleven elements. The team found that M1-11 is a very young planetary nebula, which formed from material ejected by the star ~1000 years ago; and it evolved from a star 50% more massive than the Sun. The obtained values in M1-11, namely, the C60 mass and temperature, the elemental composition of the gas in the nebula, the mass of the progenitor star, and the evolutionary status, are very similar to those seen in other planetary nebulae containing C60, e.g., Tc1, where the cosmic C60 was detected for the first time by the SST (Note 3). The team concluded that C60 is likely to form in carbon-rich dusty objects such as M1-11. They believe that chemical processing and the destruction of HAC (hydrogenated amorphous carbon) by the radiation as well as the strong wind from the central star of a planetary nebula produce the cosmic C60. Using the Subaru Telescope's Cooled Mid-Infrared Camera and Spectrometer (COMICS), Otsuka has recently started a new project to investigate the spatial distribution of C60 in planetary nebulae to verify the C60 formation scenario. As Otsuka stated, "These new Subaru observations will further clarify the C60 formation process". More information: The research paper was published in The Astrophysical Journal (Otsuka et al." 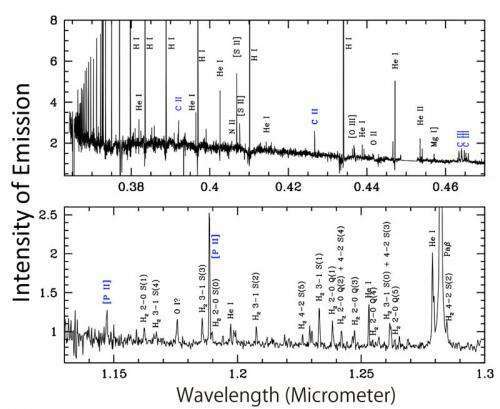 The Detection of C60 in the Well-Characterized Planetary Nebula M1-11" The Astrophysical Journal, 764:77 (20pp), 2013 February 10).